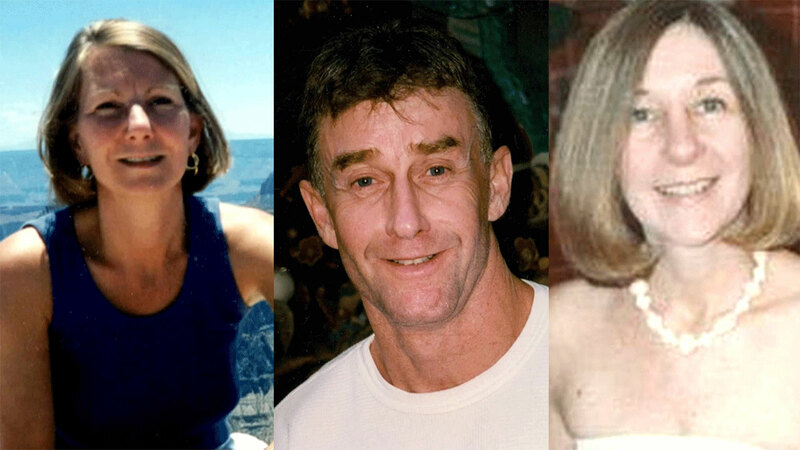 Michael Peterson’s wife, Kathleen, died a bloody death in December 2001. He says he found her at the bottom of stairs in their home after what he believes might have been a fall. He was convicted of murder and sentenced to life in prison but released in 2017 after making a plea deal, but insists he had nothing to do with her death. “You said, ‘I will not plead guilty. I will not say that. Those words will never come out of my mouth. I won’t do it no matter what,’ But then you did,” Dr. Phil says to Peterson in the video above. 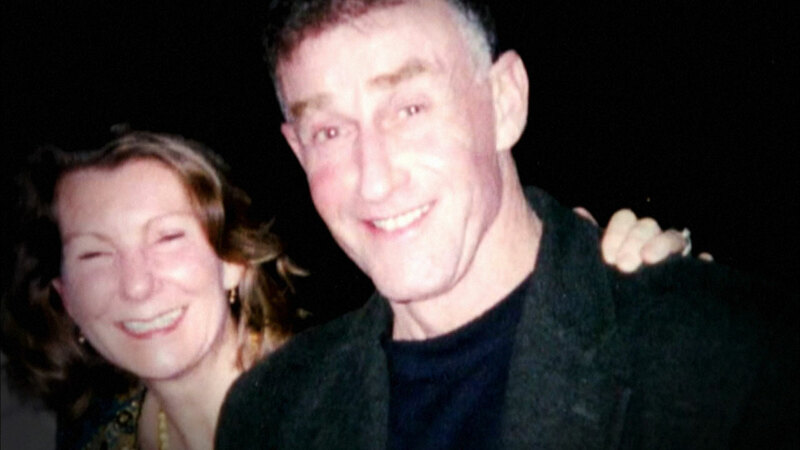 WATCH: Did Michael Peterson Murder His Wife And Try To Make It Look Like An Accident? On Tuesday, hear about an unusual theory involving an owl that some believe may explain how Kathleen died. Check here to see where you can watch. Michael Peterson was indicted and charged with murder after his wife, Kathleen, was found bloody and barely conscious at the bottom of a staircase in their home. During the trial, he allowed cameras to follow him for a Netflix documentary called The Staircase. The film, which was recently re-released, left many people wondering if Peterson, who insists he’s innocent, was an unlucky man or a murderer walking free. On Tuesday, learn about an unusual theory of how some people believe Kathleen may have really died. Check here to see where you can watch. “Once you’re in the crosshairs of the criminal justice system, it is very hard to emerge unscathed,” says Justin Paperny, federal prison consultant and ethics speaker. Paperny, who spent time in prison and now prepares others for their time behind bars, visits with Dr. Phil on this week’s Phil in the Blanks podcast to discuss the infamous college admissions cheating scandal involving celebrities and wealthy parents. Watch a preview in the video above, and tune in Tuesday, when Paperny, author of Lessons From Prison and Ethics in Motion, reveals what he believes is the motivation that caused these parents to cheat – and why he believes the defendants in the headline-making scandal are going to prison. This episode of Phil in the Blanks drops Tuesday. Listen and subscribe here. When Kathleen Peterson’s bloody body was found at the bottom of a staircase in her home, her husband, Michael, said he believed she had fallen. There was a great amount of blood on the staircase and splattered on the walls. Peterson, who was convicted of murder and sentenced to life in prison but was set free after eight years, maintains he had nothing to do with her death. On Tuesday’s episode of Dr. Phil, Dr. Phil asks Peterson, “Did you kill your wife?” Hear his response in the video above. And, hear about an unusual theory including an owl that some believe may explain how Kathleen died. On Tuesday, Peterson explains why he took a plea agreement even though he maintains his innocence. Check here to see where you can watch. Michael Peterson spent eight years in prison after he was convicted of killing his wife. During an interview with Dr. Phil airing Tuesday, Peterson shares what he thinks is the worst thing about prison and why he wants to shine a light on the prison system in America. Hear more from Peterson in the video above, including what he wants people to know about him – and what he would tell his wife today. Leila says now that she’s 50 and going through menopause, she has noticed changes to her skin and appearance – and she wants to “bring beauty back” to her face. Leila joins Dr. Phil on Tuesday’s episode along with Chi-Lan Lieu, beauty expert and spokesperson for beauty brand No7. Chi-Lan suggests Leila try No7 Lift & Luminate Triple Action Serum which can help firm her sagging skin and reduce the appearance of wrinkles. “Not only does it support collagen production, but it has three clinically-proven results: it visibly firms the skin, it evens the skin tone, and in No7’s clinical trials, 89% of women showed a reduction in the appearance of wrinkles,” Chi-Lan tells Leila. Hear more about No7 Lift & Luminate Triple Action Serum and Chi-Lan’s other beauty tips in the video above. Start seeing results in as little as two weeks with No7 Lift & Luminate Triple Action Serum which is available at Target and Target.com for less than $35. Michael Peterson was convicted of murdering his wife, Kathleen, and sentenced to life in prison after her bloody body was found at the bottom of a staircase in their home. Peterson, though, claims he had nothing to do with her death. On Monday’s episode of Dr. Phil, Peterson, who was set free in 2017 after eight years behind bars, sat down for a revealing interview. In the video above, get caught up on the mysterious circumstances surrounding Kathleen’s death, why Peterson believes he was convicted, and what police say could have been a motive. And, hear a shocking twist that happened 16 years prior to Kathleen’s death. On Tuesday’s episode, learn about the unusual theory of how some people believe Kathleen may have really died. Check here to see where you can watch. When Kathleen Peterson was found unconscious at the bottom of a staircase on a December night in 2001, she was covered in blood, with blood splattered on the walls and floor. Her husband, Michael Peterson, claims he found her laying at the bottom of the stairs after what he believed might have been a fall. “I have never seen that much blood from somebody falling down the stairs,” Dr. Phil says to Peterson, whom he interviews on Monday’s episode, acknowledging that he is not an expert. What does Peterson, who was convicted of murder but then had his conviction overturned, say? Why does he think there was so much blood, and how does he think it got on the walls? Hear his explanation in the video above, including why he says he believes the jury “totally discounted everything” the forensic expert said during his trial. On Monday, hear about another woman whom Peterson knew who was also found dead at the bottom of a staircase. And on Tuesday, hear about a bizarre theory that may hold the key to what really happened to Kathleen. Check here to see where you can watch. Michael Peterson says on the night of December 9, 2001, he walked into his home and found his wife, Kathleen, lying at the bottom of a staircase, covered in blood. He says he called 911 and held her as she took her last breath. The North Carolina novelist says that the coroner ruled her death an accident, but he claims that’s not what the police wanted to hear. He says police brought in an expert who claimed it was a homicide, and that’s when their focus shifted to him. “It was, literally, the first day that they were really were focusing on me as the murderer,” Peterson tells Dr. Phil on Monday’s episode. In the video above, hear what Peterson says happened when the police arrived at his home in the early morning hours. Why did he get a lawyer at 3 a.m.? And, why does he say he believes the police were “out to get” him? On Monday, Peterson explains the mysterious circumstances surrounding Kathleen’s death, and hear about another woman whom Peterson knew who was also found dead at the bottom of a staircase. On Tuesday, hear about a bizarre theory that may hold the key to what really happened to Kathleen. Check here to see where you can watch. Michael Peterson was accused of killing his wife, Kathleen, though he claims he had nothing to do with her death. He was convicted of murder and sentenced to life in prison, but released in 2017 after making a plea deal. This was not the first person Peterson cared about that was found dead at the bottom of a stairway. In the video above, he explains what happened to a good friend of his in Germany in 1985 – and what happened when the woman’s body was exhumed after Kathleen’s death. On Monday, Peterson explains the mysterious circumstances surrounding Kathleen’s death. And on Tuesday, hear about a bizarre theory that may hold the key to what really happened to Kathleen. Check here to see where you can watch. Is Michael Peterson an unlucky man or a murderer walking free? On December 9, 2001, Peterson called 911 reporting that his wife, Kathleen, appeared to have fallen down the stairs and was barely alive. A few weeks after her death, Peterson was indicted and charged with her murder. During the trial, prosecutors tried to convince the jury that Peterson killed his wife with a blow-poke – a fireplace tool – possibly for insurance money and because she had discovered his secret bisexuality. 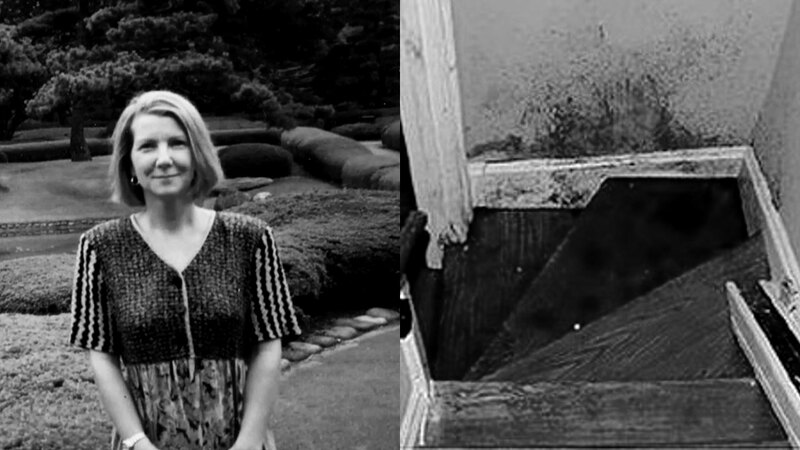 This wasn’t the first time a woman whom Peterson knew was found dead at the bottom of a staircase. In the video above from Monday’s episode of Dr. Phil, hear what happened in Germany in 1985. And, hear why Peterson, who was initially found guilty of murdering Kathleen and spent eight years in prison, was set free in 2017. Plus, see a preview of The Staircase, a documentary that followed him during his trial which was recently re-released on Netflix. Michael Peterson claims after spending a night out in the garden with his wife, Kathleen, he went inside to go to bed when he found Kathleen bloody at the bottom of the staircase. 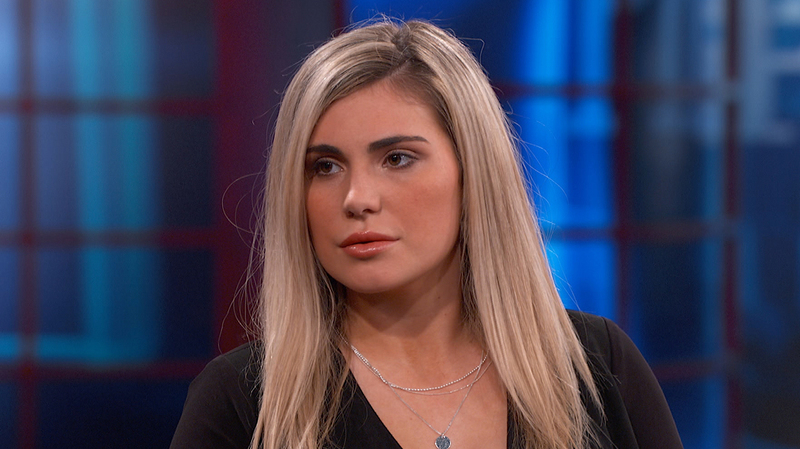 “She was crumpled up on the floor, and I picked her up, and I held her, and then I called 911,” Peterson tells Dr. Phil on Monday’s episode. What happened to Kathleen that fateful night in 2001? Prosecutors argued that Peterson killed his wife for insurance money and because she had discovered a secret. He was convicted of murder and spent eight years in jail, but was set free in 2017. In the video above, Peterson, who has consistently defended his innocence, describes the night Kathleen died. And on Monday, hear about another woman whom Peterson knew who was also found dead at the bottom of a staircase. On Tuesday, hear about a bizarre theory that may hold the key to what really happened to Kathleen. Check here to see where you can watch. Michael Peterson says he was convicted of murdering his second wife, Kathleen, for three reasons. “They convicted me because of blood. 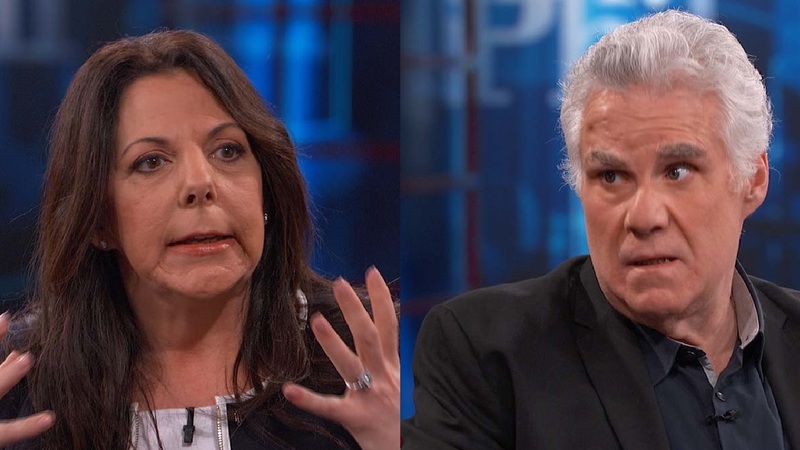 They convicted me because of bisexuality, junk science … and there was an awful, awful, awful lot of press coverage, and it was not favorable at all,” he tells Dr. Phil on Monday’s episode. Peterson, who served eight years in prison but was set free in 2017, defends his innocence. In the video above, he claims his wife knew about his sexual “tendencies” and that it was not an issue in their relationship, let alone a motive for him to kill her. WATCH Misophonia Explained – Do You Suffer From It? When Ann Marie claims she has an undiagnosed underlying neurological disorder that causes her to react negatively to certain sounds, how does Dr. Phil respond? Check here to find out where you can watch Friday’s episode. Ann Marie says she believes she has Misophonia, a neurological disorder that she claims causes her to have strong negative reactions to specific sounds, like the chewing and jaw popping noises she says her fiancé, Jimmy, makes when he eats. She says she needs help getting her reactions to the sounds that bother her under control. Jimmy recently called off his engagement to Ann Marie. He says he’s done living with her angry outbursts. When Dr. Phil says Ann Marie’s intolerance of certain sounds may be, “a mask for an unhealthy need to control unrealistic expectations,” how does she respond? Ann Marie says she has “an immediate reaction of anger” to the crunching, chewing, jaw cracking noises her fiancé, Jimmy, makes when he eats. He recently called off his engagement to Ann Marie saying he’s done living with her nagging and angry outbursts. Ann Marie claims Jimmy is disrespectful. She claims he calls her names, dismisses her opinions, rages, has a problem with alcohol and has sometimes “picked up” other women when they fight. Does Jimmy say he’s committed to saving his relationship with Ann Marie? Plus, find out if Ann Marie accepts when Dr. Phil refers her to Onsite. 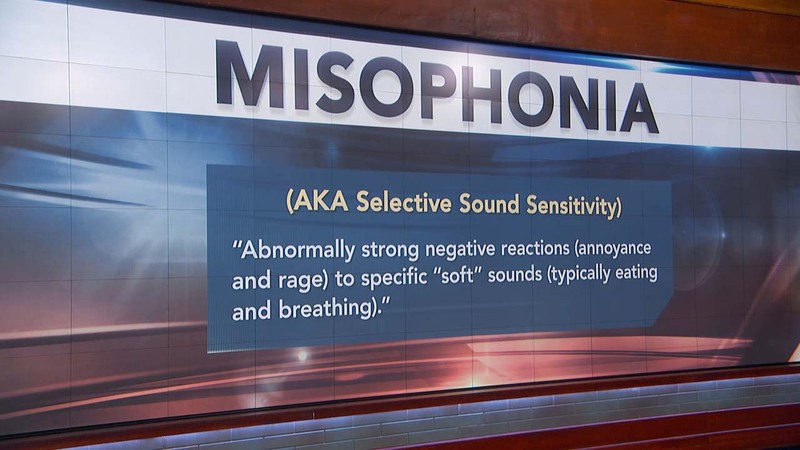 Ann Marie claims she has an undiagnosed case of Misophonia. She says she has been extra-sensitive to certain sounds for the past 46 years, and her angry responses to those sounds are negatively impacting her relationships. Ann Marie’s fiancé, Jimmy, recently called off their engagement, saying he can no longer live with her angry outbursts. Also known as Selective Sound Sensitivity, Misophonia is defined as having abnormally strong negative reactions, including annoyance or rage, to specific “‘soft” sounds, such as eating and breathing. Watch the video above to learn more about Misophonia and some of the related disorders which often accompany it. Plus, does Dr. Phil agree with Ann Marie’s self-diagnosis, or does he say he thinks there may be something else going on with her? Ann Marie says her sensitivity to certain sounds is affecting her everyday life and relationships. She says her extreme reactions to certain noises, like the sound of her fiancé, Jimmy’s, jaw clicking, has negatively impacted their intimacy. Ann Marie says she gets instantly angry listening to the noise her fiancé, Jimmy, makes when he eats but has no problem listening to her pet potbelly pigs when they do. “I hear it differently coming from a human than I hear it coming from an animal,” she says. Ann Marie has diagnosed herself with Misophonia, a condition which she claims causes her to be extra sensitive, and have a strong negative response, to certain sounds, such as dentures, typing on a keyboard, and people walking in flip-flops. How does she respond when Dr. Phil suggests her reactions are situation-specific, and that she has more control over them than she thinks? When Reina was 10 years old, she was caught in a house fire and barely survived. Her father rescued her, but most of her body suffered third-degree burns and she had a long recovery. Now, the 20-year-old, who says she suffers from anxiety and PTSD, admits to self-medicating with alcohol. Reina says she has “zero motivation,” has dropped out of college and lives off of the insurance settlement payments, and when money runs out, she asks her father for more. What does she want out of life? And, why does she think she’s stuck? In the video above from Thursday’s episode of Dr. Phil, she discusses her current situation. And, Dr. Phil reads a letter he asked Reina to write about the story she will tell herself if she doesn’t make the most of this opportunity. On Thursday, Dr. Phil offers Reina the opportunity to work with professionals to change her life. Will she agree? Check here to see where you can watch.